Known as one of the most iconic views to NJ’s mountains region and a major gateway for those entering the state from the west. 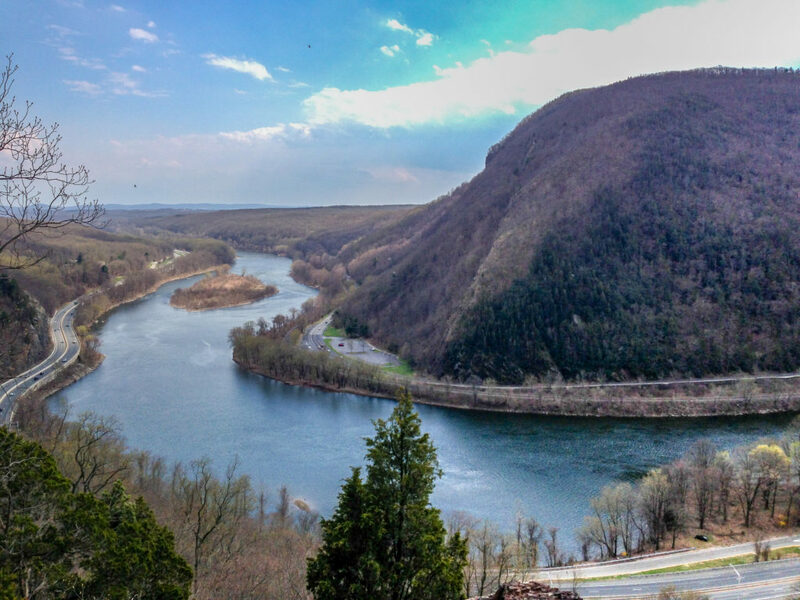 The Delaware Water Gap sits between two peaks, Mount Mimsei & Mount Tammany carved apart by glaciers and the Delaware river itself. Mount Tammany standing at 1,526 ft high, makes up the east side of the Delaware Water Gap and is the southernmost peak on the Kittatinny Mountain Range. 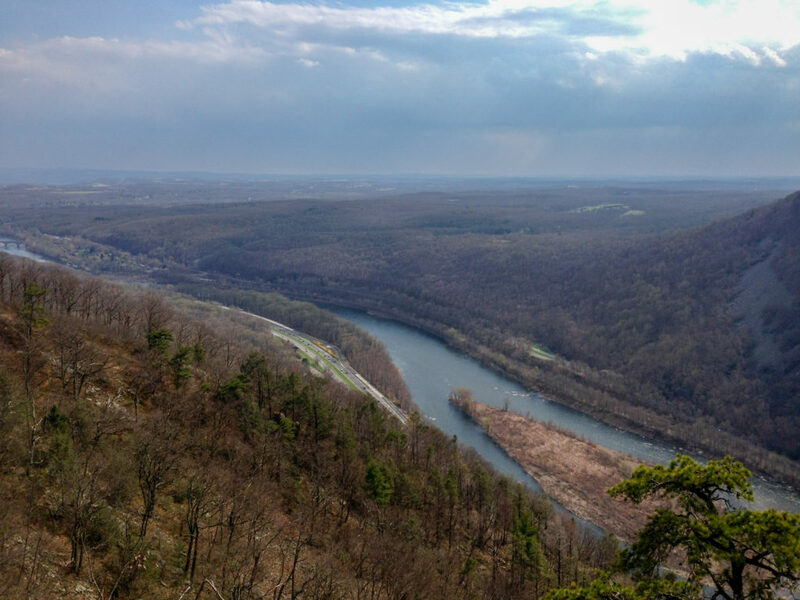 This mountain and it’s summit is a popular hiking destination for hikers around New Jersey and eastern Pennsylvania. Large cliffs towering several hundred feet up its southern slope, a large scree & talus field sits at the very foot of these cliffs with it’s only barrier being the route 80 highway and the Delaware river itself. 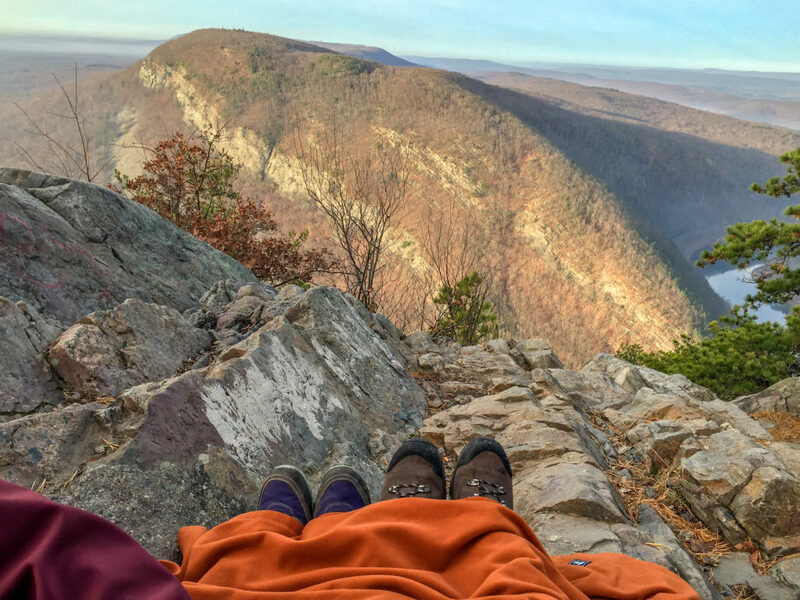 These very cliffs running almost all the way to the summit lends to a balcony like view of the Delaware Water Gap and offers some of the best natural views one can experience in the state of NJ. The hike it’s self is relatively short, only roughly 3.3 miles round trip from the parking lot to the summit of Mount Tammany and back. Although the hike may be only a little over 3 miles long, it is pretty steep compared to most hikes you may find in throughout the area. The vertical gain from the parking lot to the summit is 1,200 feet over only 1.5 miles. So take your time to enjoy the hike, the surroundings, as well as the views on your way up! 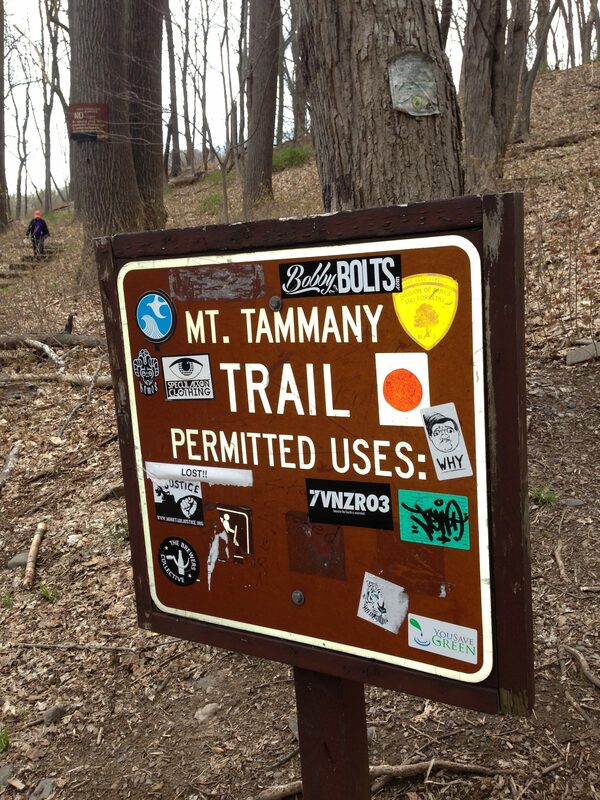 When you arrive into the lot and park the car, look toward the end of the lot and you will see the trailhead where there will be a sign for the Mount Tammany trail. Here you will find the red dot trail markers, this will be the trail and markers you will follow to the summit of Mount Tammany. As you make your way up the trail will find yourself traveling through wooded pine and rock steps. As you make your way through the first .2 of a mile the trail will narrow and on your left-hand side will be a ravine with a stream running through it. Roughly about .5 miles up you will come over a rocky bulge to your first prominent outlook. Here you will have a beautiful view of the Delaware river, Mount Mimsei and arrowhead island in the middle of the river off in distance. You have made it up 400 vertical feet so far. No matter the season, this is always a great spot to sit and reflect, especially after a long day at work. After you have taken in this view of the Delaware Water Gap carry on up the trail. You will find yourself hiking through a fairly open forest that has you go over what looks to be a mostly dry stream after crossing this section you will find the trail becomes talus steps, rocky and steep. Take your time through here as some of it can be loose and even wet depending on how recent the last rainfall was. Continue your way up past the rocky section and you will find the trail becomes a dirt path again gradually making it’s way up. You will begin to notice outlooks through the trees and pitch pine becoming more abundant. You will come to a point where you will see three trail markers in a shape of triangle, this is where the trail ends and you have reached the summit! You will see a foot path that turns right toward a rock outcropping. 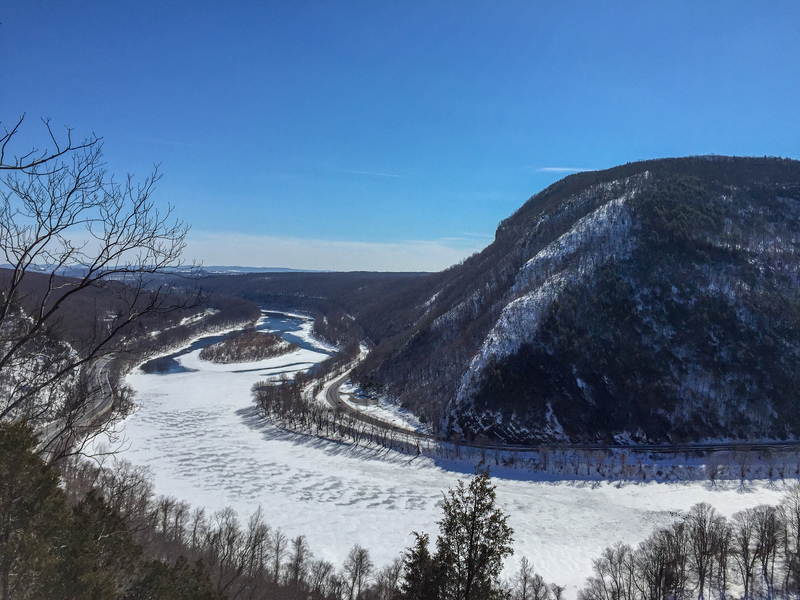 Take a walk down toward the outcropping to see an open view of the Delaware Water Gap, Mt. Mimsei, surround foot hills & valleys of NJ & PA. This is a great place to sit for breakfast or lunch and watch the many different birds such as hawks, crows, vultures etc ride the winds passing through the Gap. 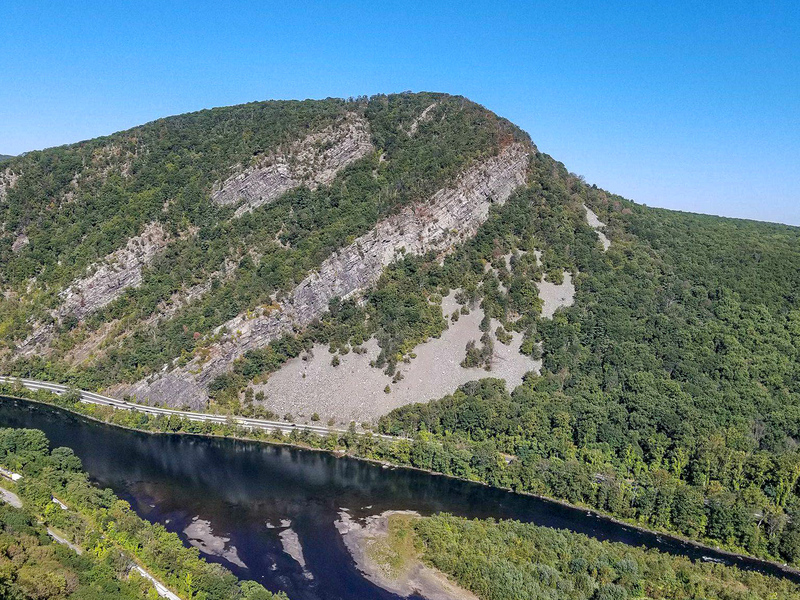 Once you are done taking in the beautiful views of the Delaware Water Gap and the surround landscape, simply follow the rock outcrop back up to trail and head back down the way in which you came from following the red dot markers of the Mount Tammany trail back down the mountain!